Chip sales are down, but Qualcomm is up. Waaaay up! Worldwide chips sales are set to decline by 2.3 percent in 2012 as established markets shrink, and worries over global economic health cause buyers to cut orders. However, there are two bright spots amid the gloom: Qualcomm (s qcom) and the wireless industry. Qualcomm should see its sales grow by 27.2 percent year over year according to IHS iSuppli, far faster than the overall 7.7 percent growth expected for the wireless segment this year. This brings Qualcomm up to the third largest chipmaker in the world for 2012 and shows how the shift to mobile devices and consolidation in the server and PC market has changed the fortunes of the chip industry’s biggest players. So while Intel(s intc) is still the top chipmaker in the world, it is expected to see its sales decline by 2.4 percent, roughly in line with the chip industry as a whole. Of course, with an anticipated $47.54 billion in sales and a whopping 15.7 percent of the overall chip market this isn’t surprising. Qualcomm’s growth came off of a much smaller base to reach an anticipated $10.2$12.98 billion in sales. 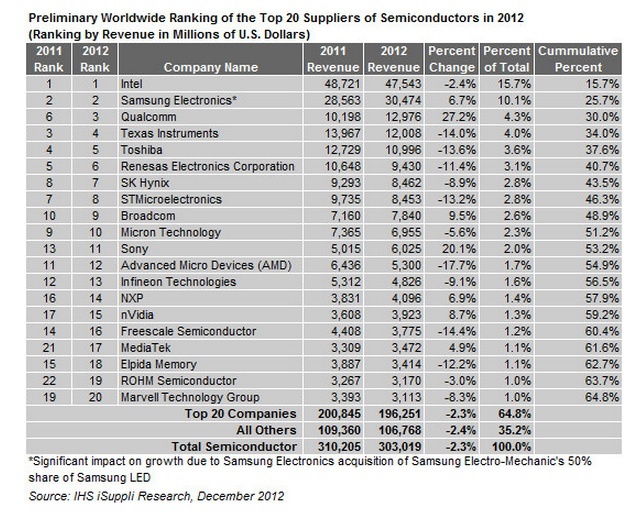 Other notable bits from the IHS rankings include Samsung still at the No. 2 spot and experiencing growth above and beyond the overall industry thanks to its share in Samsung-LED. LED lighting and certain sensor components grew this year as well. Broadcom (s brcm) and Nvidia (s nvda) should also see higher percentage growth while both Texas Instruments (s txn), Freescale and AMD (s amd) were the biggest losers. IHS iSuppli expects this downturn to be short-lived as long as the global economy continues to stabilize. It anticipates growth in 2013 to hit 8 percent. The real winner in this story is Arm Holdings. That’s the 2011 number,2012 is just under 13B. Thanks for pointing that out. Fixed.